The US$1 billion project was designed by COOKFOX Architects, and advertised to be one of the most efficient and ecologically friendly buildings in the world. It is the fifth tallest building in New York City, after One World Trade Center, 432 Park Avenue, 30 Hudson Yards, and the Empire State Building, and the seventh tallest building in the United States. Construction was completed in 2009. The building's Urban Garden Room at 43rd Street and 6th Avenue is open to the public as part of the city's privately owned public space (POPS) program. The building is 55 stories high and contains 2,100,000 square feet (195,096 m2) of office space, three escalators and a total of 52 elevators--50 to serve the offices and two leading to the New York City Subway's mezzanine below ground, for the 42nd Street – Bryant Park / Fifth Avenue station. The tower's architectural spire is 255.5 ft (77.9 m) tall and was placed on December 15, 2007. Several buildings were demolished to make way for the tower. Among them was the Hotel Diplomat, a 13-story structure which had occupied the site at 108 West 43rd Street since 1911, and Henry Miller's Theatre, which was rebuilt and reopened at its previous location. The building's tenants include Bank of America as the anchor tenant and Marathon Asset Management, and the tower's platinum LEED rating and modern column-free office space has enticed tenants from all over the city. The Bank of America Tower is considered a worldwide model for green architecture in skyscrapers. The design of the building makes it environmentally friendly, using technologies such as floor-to-ceiling insulated glazing to contain heat and maximize natural light, and an automatic daylight dimming system. The tower also features a greywater system, which captures rainwater for reuse. Bank of America states that the building is made largely of recycled and recyclable materials. Air entering the building is filtered, as is common, but the air exhausted is cleaned as well. Bank of America Tower is the first skyscraper designed to attain a Platinum LEED Certification. The Bank of America Tower is constructed using a concrete manufactured with slag, a byproduct of blast furnaces. The mixture used in the tower concrete is 55% cement and 45% slag. The use of slag cement reduces damage to the environment by decreasing the amount of cement needed for the building, which in turn lowers the amount of carbon dioxide greenhouse gas produced through the normal cement manufacturing process. Each ton of regular cement produced creates about one ton of carbon dioxide in the atmosphere. Temperature control and the production of some of its energy are accomplished in an environmentally friendly manner for the tower. Insulated glazing reduces thermal loss, lowering energy consumption and increasing transparency. Carbon dioxide sensors signal increased fresh air ventilation when elevated levels of carbon dioxide are detected in the building. Conditioned air for the occupants is provided by multiple air column units located in the tenant space that deliver 50 °F air into a raised access floor plenum. This underfloor air system provides users with the ability to control their own space temperature as well as improving the ventilation effectiveness. When building churn occurs, workstation moves can be performed more easily with lower cost and less product waste. The cooling system produces and stores ice during off-peak hours, and allows the ice to melt to help cool the building during peak load, similar to the ice batteries in the 1995 Hotel New Otani Tokyo in Japan. Ice batteries have been used since absorption chillers first made ice commercially available 150 years ago, before the invention of the electric light bulb. Water conservation features in the tower include waterless urinals, which are estimated to save 8,000,000 US gal (30,000,000 l) of water per year and reduce CO2 emissions by 144,000 lb (65,000 kg) per year (as calculated with the Pacific Institute water-to-air model). The tower has a 4.6-megawatt cogeneration plant, which provides part of the base-load energy requirements. Time magazine reported in August 2013 that the Bank of America Tower used twice as much energy overall as the Empire State Building, due to the large energy usage in the Bank of America Tower and the comparatively small occupancy rate of the Empire State Building. With the architectural spire included, the structural height of the Bank of America Tower is 1,200 ft (370 m), making it the fifth tallest building in New York City (after One World Trade Center, 432 Park Avenue, 30 Hudson Yards, and the Empire State Building). A formal ruling by the Council on Tall Buildings and Urban Habitat confirmed this. In October 2009, the building was featured on episode 100 of the National Geographic Channel television series MegaStructures. 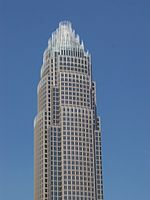 In June 2010, the Bank of America Tower was the recipient of the 2010 Best Tall Building Americas award by the Council on Tall Buildings and Urban Habitat. August 12, 2008: A 1,500-pound (680 kg) glass panel fell onto a sidewalk. Two people suffered minor injuries. September 17, 2008: A debris container fell, shattered a panel of glass facade, and caused several pieces of glass to fall from the 50th floor to the sidewalk and street (West 42nd and Avenue of the Americas) at around 3:00 pm (EDT). No one was injured. The Bank of America Tower appears in HBO's The Newsroom as the headquarters of Atlantis World Media, with CGI being used to change the name of the building above the entrance. In the Daredevil episode "World on Fire", Foggy Nelson and Karen Page have a meeting with Foggy's ex-girlfriend Marci Stahl in the Bank of America Tower's lobby, representing the offices of Landman & Zack. In Jessica Jones, the offices of Hogarth Chao & Benowitz are located in the Bank of America Tower. In Younger, the offices of Empirical Publishing are located in the Bank of America Tower. ^ a b c d e f g h "Bank of America Tower - The Skyscraper Center". Council on Tall Buildings and Urban Habitat. ^ "Bank of America Tower". SkyscraperPage. ^ C.J. Hughes (5 November 2008). "New Skyscraper Stars in National Geographic Show". Architectural Record. archrecord.construction.com. Archived from the original on 12 June 2011. Retrieved 2011-05-27. ^ "One Bryant Park". Van Deusen & Associates. Retrieved 2014-02-27. ^ Dunlap, David W. (7 November 1993). "An Aging Midtown Hotel That Will Not Go Gently". The New York Times. NYTimes.com. Retrieved 2011-08-10. ^ McDonnell, Tim (16 September 2015). "There's been a boom in energy-efficient skyscraper construction". Grist. ^ a b "Bank of America and The Durst Organization Break Ground On the Bank of America Tower at One Bryant Park in New York City" (Press release). Bank of America Corporation. 2 August 2004. Archived from the original on 23 October 2007. Retrieved 2007-10-19. ^ Cook, Richard A.; Hartley, Alice (6 June 2005). ""What is Free? ": How Sustainable Architecture Act and Interacts Differently" (PDF). United Nations. Archived (PDF) from the original on 28 November 2007. Retrieved 2007-10-19. ^ "EF Technology". U.S. Concrete, Inc. Archived from the original on 2007-10-05. Retrieved 2007-11-08. ^ "Ice-cooling System Reduces Environmental Burden". The New Otani News. New Otani Co., Ltd. 28 June 2000. Archived from the original on 7 October 2007. Retrieved 2007-11-08. ^ Foley, Gearoid; DeVault, Robert; Sweetser, Richard. "The Future of Absorption Technology in America" (PDF). U.S. DOE Energy Efficiency and Renewable Energy (EERE). Archived from the original (PDF) on 28 November 2007. Retrieved 2007-11-08. ^ Pacific Institute. "Water to Air Models". Archived from the original on 2008-12-11. Retrieved 2008-06-13. ^ Walsh, Bryan (2013-08-14). "The Surprisingly Large Energy Footprint of the Digital Economy [UPDATE]". TIME.com. Retrieved 2015-09-18. ^ Satow, Julie (6 August 2013). "Worker Bees on a Rooftop, Ignoring Urban Pleasures". The New York Times. The New York Times Company. Retrieved 2014-02-27. ^ "Photo of Bank of America Tower: Elevations". Emporis. Cook + Fox Architects, LLP. 4 September 2005. Retrieved 2007-10-19. ^ "100 tallest completed buildings in the world". Council on Tall Buildings and Urban Habitat. 2011-02-03. Retrieved 2012-05-01. ^ "Green Buildings Solutions: What's Working? Post Occupancy Evaluation". New York Academy of Sciences. 15 April 2010. Retrieved 2014-02-27. ^ "CTBUH 9th Annual Awards, 2010". Council on Tall Buildings and Urban Habitat. Retrieved 2007-06-15. ^ "Crane's Bucket Falls 53 Stories In Midtown". WNBC. 2007-10-17. Retrieved 2007-10-19. ^ Hauser, Christine (12 August 2008). "At a Midtown Intersection, Another Sheet of Glass Falls". The New York Times. Retrieved 2008-08-26. ^ "Glass Falls 50 Floors From Midtown Building". 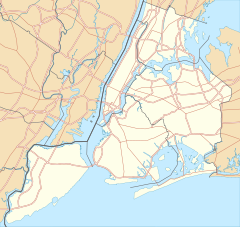 NY1. 17 September 2008. Retrieved 2014-02-27. 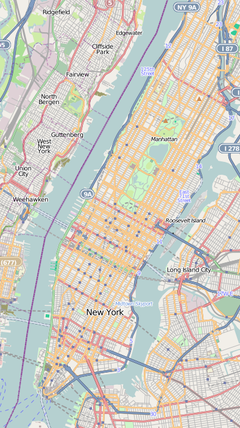 Wikimedia Commons has media related to Bank of America Tower (Manhattan).